SKU: hotCHOC (hC) - Art.-Nr. 12-140-105. Availability: 9 in stock Size: 33 × 25 × 13 cm Shipping Weight: 1.64 kg Category: Food. The hotCHOC (hC) gun is a heated chocolate spray gun! It has been designed specifically in close cooperation with Barry Callebaut (UK) to spray a mixture of 50% chocolate / 50% cocoa butter at a temperature range of 28C-35C / 82F-95F. A special heating unit and insulation sleeve encasing the nozzle keeps the chocolate fluid and the container insulation slows down the materials rate of cooling. The 40W power settings and nozzle & piston sizes enable a thin layer of material to be sprayed, with minimal overspray or noise compared to other sprayers and air brush systems. This purpose built handheld electric chocolate sprayer can be used for covering fingerprints/finishing, creating a velvet/frozen effect, prepping moulds, speckling pralines or adding thicker layers to cakes & pastries, etc. 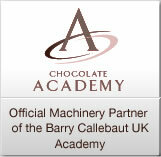 This is a ‘must have’ tool for any professional chocolatier, artisan or pastry chef. Solves clogged nozzle issues – the nozzle warmer and insulation avoids the need to reheat with a hot air gun! Work for up to an hour without needing to reheat the container due to the insulation. Localised spray pattern- minimal overspray. Uses only Food Grade materials. Simple, reliable and easy to use – no compressed air needed. This reduced power setting also allows you to create wonderful ‘velvet’ effects without blasting your masterpiece off the table. It can also be used for working with different materials/temperatures than those recommended such as glazes or other low viscosity materials. Performance and results then will vary. Each hotCHOC (hC) chocolate spray gun comes with a 550ml container, bent nozzle extension, nozzle-heating unit, container & heating unit insulation sleeves and a round-jet-nozzle R6.